Hello - thank you all for being so kind and helpful! When we bought our house last year, as new pool owners, we really thought it was supposed to be light green! In fact, my husband was convinced the plaster was not white, but light green. 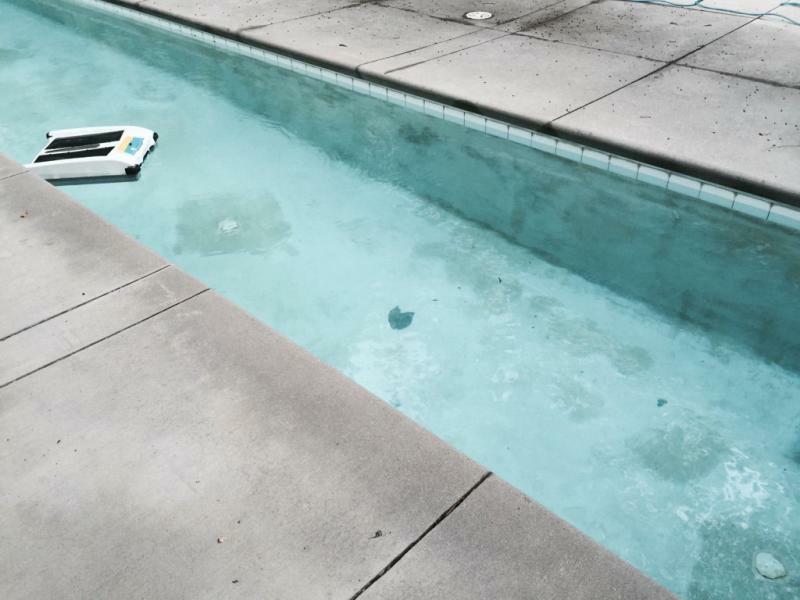 However, after our pool turned DARK green a few months ago, we realized that skimming, vacuuming and using chlorine pucks regularly might not be as simple as we first thought. After consulting with "experts" and getting bad advice, we found TFP and thanks to all of you, our water is now beautiful! We actually swam in it for the first time this season - last week. Unfortunately we have patches of discoloration that we cannot seem to clean. We run our new robot several times a day. We also have brushed and brushed. 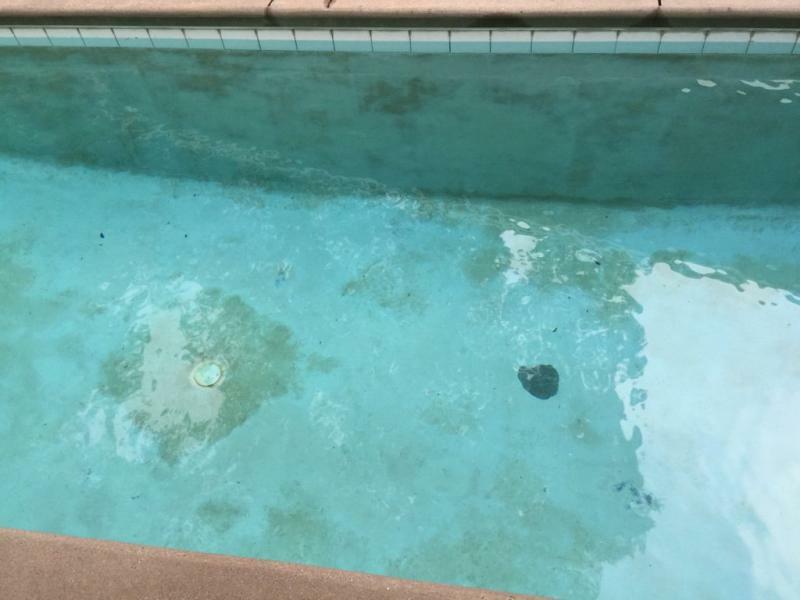 We spent last Sunday afternoon IN the pool attempting to clean it from the inside. No such luck. It has rained a lot this week and the discoloration looks even worse since last week. My husband suggested that maybe we can just see it more clearly now, since the water is clearer! In any case, do you have any advice for us? We really hope we do not have to drain and do an acid wash. The plaster is 14 years old and rough in some areas on the side. 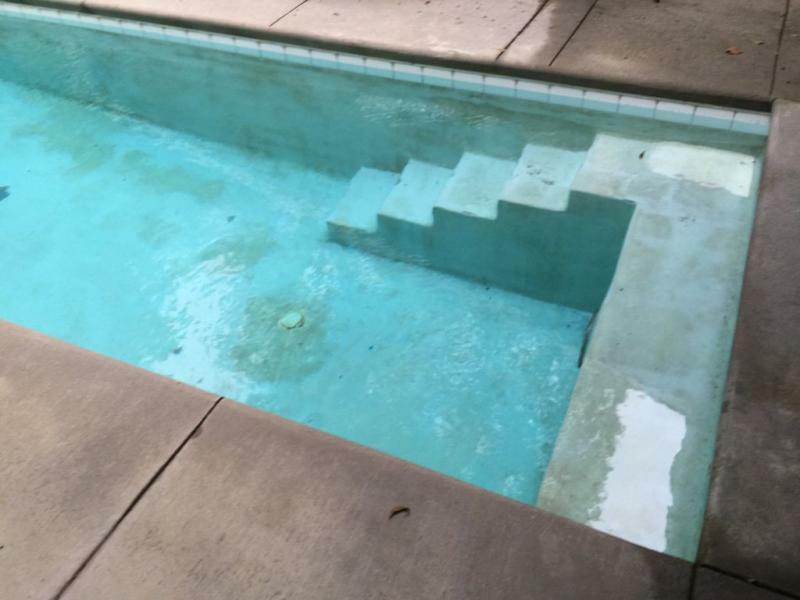 You will note that our decking needs a good power-washing and there are a few spots on the floor of the pool that need plaster repair. The waterline tile is white (WHY would someone install WHITE tile??) and is actually clean, though it has a strange grayish discoloration on the top that dips to the grout lines. Resurfacing and retiling is so much more than we anticipated and we are hoping to get to next year before we tackle. I will post photos below! It actually looks a little better in person. These were taken right at dusk tonight. Water looks great! It is fine to wait another year or two to replaster as long as the pool holds water and the plaster remains adhered to the shell. It will become more porous and hold more dirt. You might be able to clean it with muriatic acid but that will likely shorten the remaining life. So, that is a trade off between looking cleaner or functioning longer. 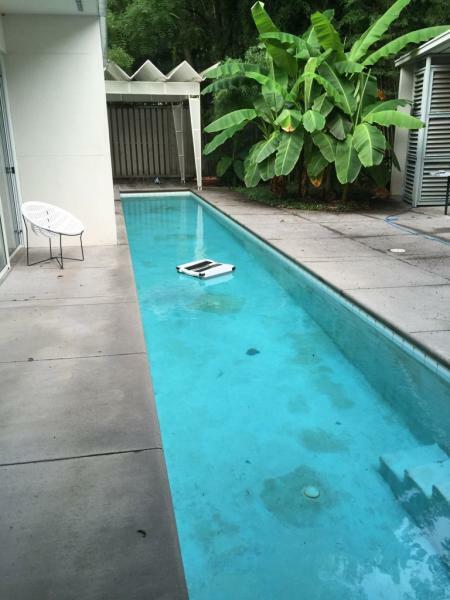 I would keep your CSI balanced according to Poolmath and hope it lasts until you are ready to replaster. Thank you pooldv! So there is no hope and we just have to live with these stains until we replaster? At what point do you absolutely have to replaster? We were hoping we could have the broken plaster spots patched, but the stains look so bad. There are no leaks, thank goodness! The water looks beautiful. The FC is only 3 but the FC/CYA chart calls for minimum FC of 5 and target of 8 for cya of 70 (always round up). Have you tried identifying the stains using the puck test and the Vitamin C test? I cant say if this has anything to do with the staining but it's my understanding that with a plaster pool your CH should be somewhere between 250 & 350. Some of those "stains" on the wall actually look like missing plaster as opposed to a stain. The discoloration around the drain is probably there to stay until you replaster, which from the looks of it should be relatively soon, depending on how it feels structurally---mine looked similar to yours but was coming up in chunks, so I felt the needs to do it much faster than planned when we moved it, but if yours isn't breaking apart when you walk on it, you could wait till next season or two as pooldv said. I do agree with gilbee, that really dark spot you focused on in the 4th pic looks like plaster that's gone. I'd say leave it for now, but definitely start calling local pool stores and pool builders to start getting some quotes together. Thank you for the chemistry advice swoopman and EVChargeGuy! I will pass that info along to my chemist (husband, who's not really a chemist). Gilbee and COBrien - there is one larger spot that is definitely plaster missing on the floor and two smaller ones on the far side, but no plaster missing at all on the walls or chunks coming off. We do not feel any soft spots or see cracking either. Wait - one repaired crack on wall is visible, but looks expertly repaired. Except for that and the three "bald" spots on the floor, if the plaster was clean, I think we could get a few more years out of this. Those flex spots as you describe them are what convinced me to do the replaster NOW instead of next season. By the way, those are called hollow spots by the plaster contractors, and require full strip/chip out of the plaster in those locations; let them know up front or your quotes won't be accurate and you'll pay more than you expect in the end. 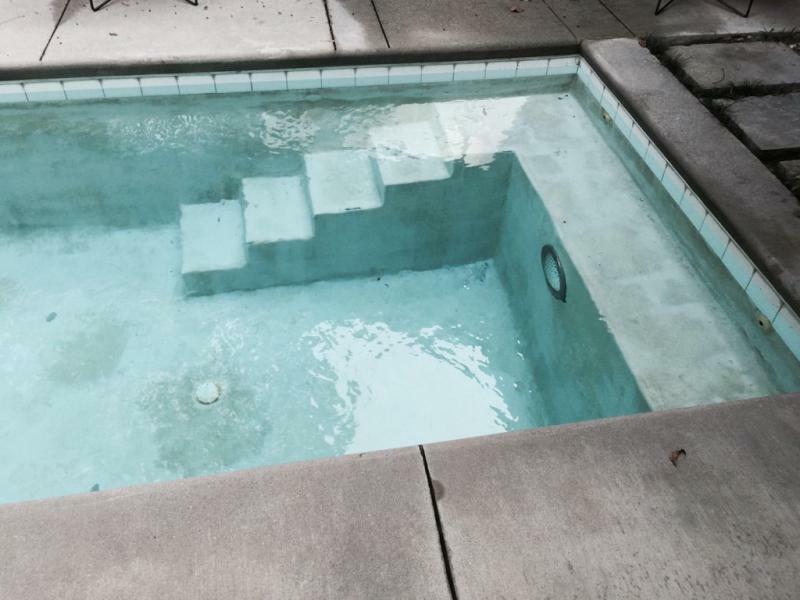 I opted to have the entire pool chipped out rather than just the spots because the cost was marginal between the two (talking hundreds, not thousands of dollars). Of course, mine were larger than 2x2incb...more like 2x2feet. I'd just make sure that, at a FC level below your minimum, you haven't developed black algae. I think you can test by place a trichlor tab right onto the stain for a period of time to see if the stain disappears. Have to run now, but search for that. With a CC of 1.5 (I would test/confirm that number), you are fighting something in the water/skimmer/filter. Based on low FC I would even hazard to say another/first slam is needed. Thank you all! We put a puck on a stain tonight and it cleaned it. Yippee! Thank you for the suggestion! I have also passed along all of the chemical level advice. Hi layla2052! Yes, it is a Solar Breeze and we LOVE it. Seriously, one of the best purchases we have ever made. The only drawback is that we cannot run it and our robot at the same time, as the Solar Breeze keeps eating the robot's cord. First world problems! I remember reading something like that about their company at the time I was looking. I'm definitely going to contact them about getting one. Thanks so much for the information! Happy swimming!